When you look at the list of 484 Golden Eagle home sales at the bottom of this article, you might be confused into believing a clearance sale was conducted. 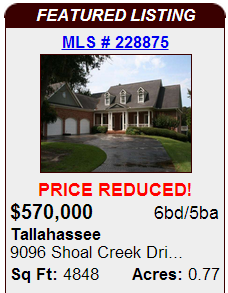 It just doesn't seem that long ago that the "average" home in Golden Eagle Plantation was worth about $500,000, but today's prices all seem to begin with a "3." So let's take a look at our quarterly Golden Eagle Home Sales Report to see what has homebuyers so excited. The number of homes for sale in Golden Eagle Plantation currently stands at 43, but at these low prices you are going to see them go to contract must faster in 2013 than we did in 2012. 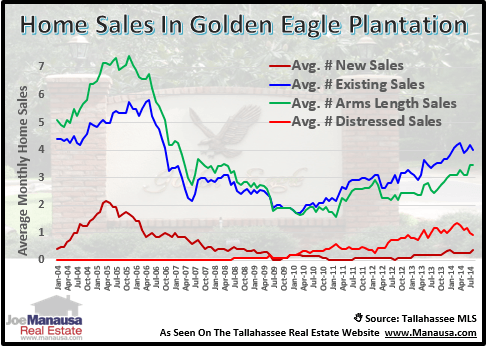 The following real estate graph shows that distressed sales are still near an all time high in Golden Eagle Plantation, and I suspect they are having a great influence on home values in this popular Northeast Tallahassee golfing community. The vertical green and red bars (stacked, measured on the left vertical axis) record arms length and distressed home sales in Golden Eagle respectively. The red line shows the percentage of distressed sales to overall home sales, and right now it's at about 23 % for the past twelve months. When we ignore the distressed sales and just focus on arms length home sales in Golden Eagle, we see that the weight of the distressed property sales has been pulling values down. In fact, current values are lower today than they were a year ago, though the trend appears to be stabilizing somewhat. 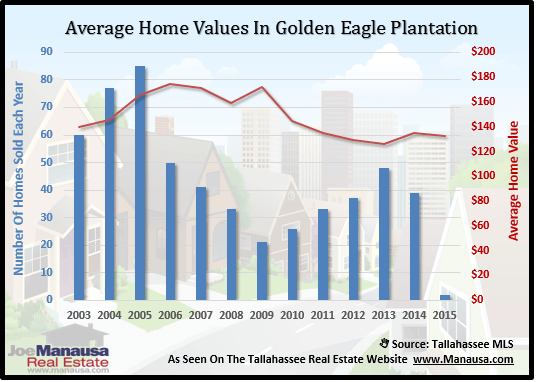 The Golden Eagle home value trend was the same in May as it was in May 2004, running right at $134 per square foot of heated and cooled space. When you contrast that with the $181 per square foot recorded in August 2007, you have to wonder how many more Golden Eagle home owners are trapped in a home with a mortgage far larger than the value of the property. If you are thinking about selling a home in Golden Eagle and are wondering about timing and pricing, just drop me a note and we can schedule a time to review your home and help you implement the best plan to sell your home.